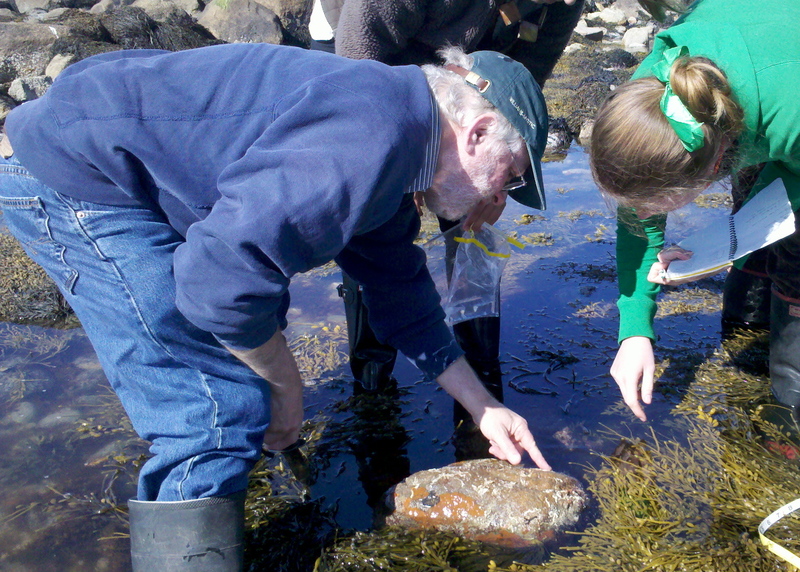 Jim Carlton is standing knee-deep in a tide pool, surrounded by three of his students. The sun reflects off the incoming tide, casting ripples of light across the biologist’s faded blue sweatshirt. With a heave and a splash, he turns over a basketball-sized rock, exposing the creatures that have colonized its underbelly. Grabbing a knife from his belt, Carlton begins to point at and identify the species aloud — spirorbidae here, brizoides there — and picks at one with the tip of his knife to get a better look. “Ouch, bad day for you,” he apologizes to the barnacle. Carlton is on the coast of Connecticut near Mystic Seaport, helping his Williams College undergraduate students begin their independent research projects. Despite the fact that the marine biologist is highly respected in his field — his colleagues call him a “big shot” and a “prodigy” — Carlton spends a great deal of time with these young people, one of whom is exploring a subject close to his heart: the proliferation of invasive marine species. After decades of warnings from Carlton and other marine biologists, the United States is finally coming to terms with the economic and environmental threats posed by waterborne invasives. A new set of rules will soon enforce more careful treatment of ballast water, one of the primary vectors for invading species and a particular interest of Carlton’s. A panel led by Carlton has just released its recommendations, commissioned by the Environmental Protection Agency, that will help impose numerical limits on living organisms in ballast water, a step toward treating exotic organisms just like chemical pollutants. Since 1962, when 14-year-old Carlton stumbled upon some curious tubeworms in a lake along San Francisco Bay, he has been fascinated by the “other” in marine ecosystems. After finding out that the worms were not native to the West Coast, teenage Carlton set up 10 stations around the lake that he diligently monitored for twelve years, finding new invasive species along the way. Never losing his enthusiasm for marine diversity, Carlton became one of a dying breed of classically trained taxonomists. His simple toolkit, a book and a pair of eyes, has largely been abandoned in favor of genetic approaches to categorizing life. Carlton worries that the decline in taxonomy will negatively impact our ability to monitor which species do and do not belong in particular ecosystems. If fewer and fewer people can identify these species, Carlton says, then how can we expect to understand changes in biodiversity? Invasive marine species in the United States have become an increasingly serious issue in recent decades, with outbreaks of ravenous Indo-Pacific lionfish along the Atlantic Coast and the appearance of a curious sea squirt known as “rock vomit” in Alaskan waters, among others. Organisms have long been hitching rides to new waters, especially in the ballast tanks of large cargo ships. But the problem only became obvious to the American public in 1988, when zebra mussels, “the poster child of invasive species,” as Carlton calls them, were first documented in the Great Lakes. Zebra mussels originated in Russia, but they have demonstrated remarkable wanderlust, showing up in rivers and lakes across Europe and the U.S. Consider zebra mussels a cautionary tale of invasive species’ destructive potential: They’ve caused billions of dollars of damage to water treatment plants and have disrupted many natural ecosystems. According to Thom Cmar, a lawyer for the Natural Resources Defense Council, zebra mussels have gulped up 80 percent of the Great Lakes’ phytoplankton, stealing food from native species and leaving the water so clear that sunlight stimulates massive blooms of toxic blue-green algae. In 1985, Carlton wrote a long paper for Oceanography and Marine Biology: An Annual Review, arguing that ballast water was playing a major role in aquatic invasions, but his observation didn’t get much attention until the zebra mussels showed up three years later. That pattern would be repeated many times over the next quarter-century, with Carlton always anticipating the threat of invaders before his “three Ps” — the public, press and politicians — catch on. “Jim coined the term ‘roulette,’ ” says marine biologist John Chapman of Oregon State University, describing the chancy game we play every time humans introduce another species where it doesn’t belong. Carlton is currently studying invasions in sparsely monitored sections of South Africa, Japan and South America, seeking to find out whether ballast water problems are to blame. Despite the urgings of Carlton and others in his field, ballast-borne “living pollution” has traditionally not been regulated as strictly as chemical pollutants. In 1972, the United States Congress passed the Clean Water Act, which was supposed to protect coastal waters, lakes and rivers from all manner of contaminants. But the newly created Environmental Protection Agency chose to exempt floating vessels from the regulations it applied to factories. Trying to fill the void left by the EPA loophole, Congress passed laws that gave the Coast Guard authority to regulate vessels. Those laws called for boats to flush out their ballast tanks with salt water before entering a harbor. But that so-called “swish and spit” method still allowed many foreign organisms to find their way to new waters. Finally, in 2005, a federal court found that the EPA was legally responsible for regulating vessel discharges under the Clean Water Act. So the agency created a new permitting process to regulate boats and ships. But the rules still weren’t any stricter than those already enforced by the Coast Guard. “They really hadn’t changed the ballfield,” says Carlton. Carlton is currently chairing a committee that will provide crucial information to guide this next stage of ballast water regulation. In early June, he and a battalion of marine scientists delivered their report, which will inform the EPA’s determination of safe numeric limits for living organisms in ballast water — the same sorts of numeric limits imposed on chemical concentrations in water. While the report emphasized the importance of modeling the impact of organism concentration, very little data is available to support such models. The report therefore focuses on how these data gaps could be filled, so that the EPA’s next round of standards have a firm base in scientific fact. Understandably, Carlton considers these new regulations “not a final step but one of many steps along the way” to maintaining marine ecosystems. He wants to see stricter regulation of other invasive vectors such as sales of exotic fish for food and pets, and he hopes that governments will soon begin the monumental task of rehabilitating ecosystems that have already been severely damaged by invasive species. His long hours would not be possible without an absolute devotion to his specialty — and a good dose of sugar. “There’s always a high probability of finding a donut within a short radius around him,” jokes Richard Everett of the U.S. Coast Guard. He’s also fueled by an irrepressible faith in the future; he believes the best way to expand environmental awareness is by teaching young people. Which is likely why, after so many years, he keeps on wading out in his rubber boots with his students, slowly and methodically teaching them their taxonomy.